This section is from the book "House Drainage And Sanitary Plumbing", by William Paul Gerhard. Also available from Amazon: House Drainage and Sanitary Plumbing. Flushing tanks should be provided in a system of house drainage, whenever it is impracticable to lay the drain at an inclination which will secure a sufficient cleansing flow. The idea underlying most of these flushing arrangements is the accumulation of a small flow of water - often merely a driblet - which continuously running, at a sluggish rate, would not be able to remove deposits in the drain. Whenever this water has accumulated to a large volume, the flush tank is automatically emptied and its contents are driven with a sudden rush through the drain. 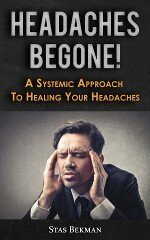 As this may be repeated as often as found necessary, the inside walls of the drain may be kept thoroughly cleansed, and any decomposition of organic matter is thus effectually prevented. Automatic flush tanks are likewise frequently used for flushing a number of water closets, urinals or slop sinks, and even a single water closet, if in an exposed locality, where the water in the supply pipes would be apt to freeze unless kept constantly running. It has been already stated that such continually running driblets are unable to produce an effective flush, but, by collecting the driblets in a flush tank, discharging automatically, when filled, the desired purpose may easily be accomplished. There are many varieties of flush tanks, such as Field's siphon tank, McFarland's tilting tank, Shone's flush tank, Maguire's, Rhoads', Hydes', Ivers', Wilson's, Guinier's tanks and others. 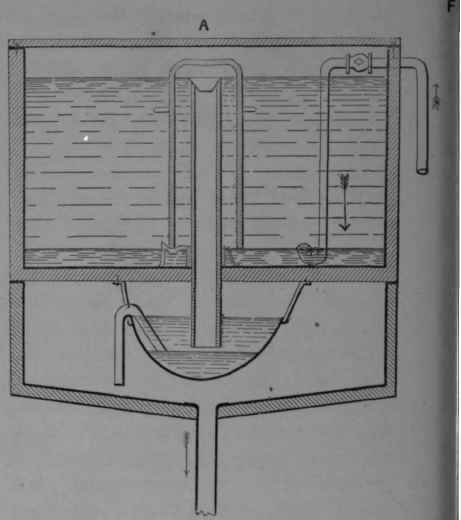 Field's flush tank, the invention of the well-known English engineer Rogers Field, has been used with success in this country. One of his tanks has a common siphon, and is started only by a sudden addition of a larger quantity of water. The other tank is provided with an annular siphon, the outen and inner limb being concentric. This tank is started by a small trickling flow. It may be constructed of small size, to flush a row of hopper closets or urinals automatically. Larger tanks are used for flushing house drains and town sewers, and are also adapted for sewage disposal by surface or sub surface irrigation. Fig. 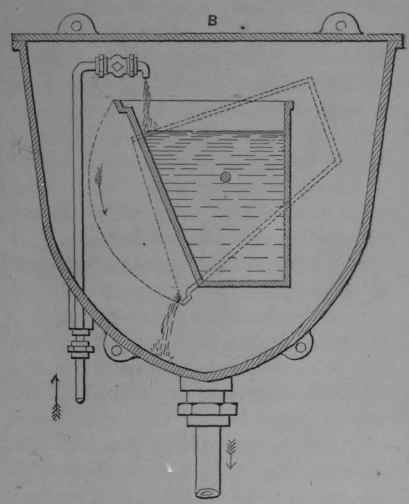 6, A, shows a Field's flush tank with annular siphon, the tank being of wood lined with sheet lead. The longer inner limb of siphon reaches into the trapping box suspended underneath, in which the water level is kept about one-sixteenth of an inch below the end of inner limb of siphon by means of the second "auxiliary " siphon. The working of the tank is as follows: As soon as the water from the faucet has filled the tank so that the water rises to the top of the longer (inner) limb of siphon, it commences to overflow, but is guided by a conical-shaped adjutage to drop clear of the sides, and seals the mouth of lower limb. In falling, the water carries air with it, which is thus displaced and driven out at mouth of inner limb in trapping box. A slight vacuum is gradually created in the discharging limb, sufficient to start the siphon, which rapidly empties the tank. As soon as air is admitted through the outer (shorter) limb of siphon its action is stopped, all the water in the inner limb drops into the water chamber, and the auxiliary siphon lowers the water line in trapping box about one-sixteenth of an inch below the mouth of inner limb. Air enters at this place and completely breaks the siphon; the tank is then ready for another discharge. The stopcock can be regulated to fill the tank more or less rapidly according to option. McFarland's tank is shown in Fig. 6, B. It works by gravity, and is simply a bucket hung in a cistern, working in brass journals. As soon as filled from a faucet regulated to let the water in slowly or quickly as desired, the bucket tips over and empties the entire contents at once. This tank is well adapted for flushing closets, slopsinks and urinals. I have endeavored, in this volume to explain what means and devices should be used, and what rules must be followed, speedily and safely to remove by the water-carriage system all liquid, and semi-liquid wastes from habitations. The all-important question of how to dispose of the waste matters of the household in the safest, least disagreeable, most efficient and most economical manner has not been referred to. The discharge of sewage into watercourses or into the sea, its treatment by chemical processes, filtration of sewage, surface and sub-surface irrigation, intermittent downward filtration of sewage, the processes of dry removal, by pail or tubs, earth closets, ash closets, cesspools, privies, vaults, manure pits and kindred subjects, the removal of garbage, kitchen slops, ashes, etc., in other words, "The Disposal of Household Wastes," will be made the subject of a future volume.